2017 ~ Mysteries of the 37th Parallel ~ Earthquakes ~ Navel of the Earth ~ Communication and Unity Among Men ~ UFOs? It finally occurred to me today to check out the latitude of Morgan Hill California. I happen to be visiting my sister in San Jose when this 1984 earthquake took place. This is over 30 years ago now. I remember being out by the condo complex pool that afternoon. The first sensation I had was the wind had picked up, but then I realized it was something else … the two other fellas on the other side of the pool and myself all froze simultaneously … the ground felt like a huge serpent was undulating/rolling up and down beneath our feet. Not long afterward, surreal time is hard to estimate, the serpent stopped and then for a brief moment there was stillness followed by an eerie feeling in the air and ‘whitecaps’ being churned up in the swimming pool! This was the only earthquake of any significant magnitude (6.2) that I had ever experienced in my life other than a very small one while I was in my Toronto apartment in the early 1980s, where I watched my 30 gallon fish-tank sway to and fro a few times, water splashing about, even producing mini white caps, without the tank stand collapsing. Whew, I lived on the third floor. The 1984 Morgan Hill earthquake (also Halls Valley earthquake) occurred with a moment magnitude of 6.2 on April 24 at 1:15 p.m. local time in Northern California. The epicenter of the shock was located near Mount Hamilton in the Diablo Range of the California Coast Ranges. The earthquake occurred along the Calaveras Fault, with the epicenter 16 kilometers (9.9 mi) northeast of San Jose, and at a depth of 8 km (5.0 mi). The significance of the coincidence regarding the location will soon be understood. Did you happen to notice the latitude of the epicenter? Note the first four numbers 37 19. Now might be a good time to remind the reader that I have recovered a theory that is intimate with the numbers 137-9 or 137-6.
of terrestrial origin not celestial (out-of-this-world) origins. In other words the UFOs are made and scripted by man not by the aLIEns. The 37th parallel north is a circle of latitude that is 37 degrees north of the Earth’s equatorial plane. It crosses Europe, the Mediterranean Sea, Africa, Asia, the Pacific Ocean, North America, and the Atlantic Ocean. 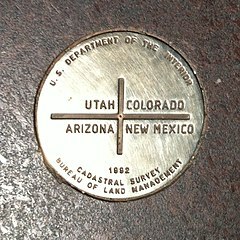 In the United States, the parallel defines the southern borders of Utah, Colorado, and Kansas, and the northern borders of Arizona, New Mexico, and Oklahoma. It dates to the Kansas–Nebraska Act of 1854 when Congress divided Indian Territory into Kansas and Nebraska north of the 37th parallel and a remainder Indian Territory to the south. 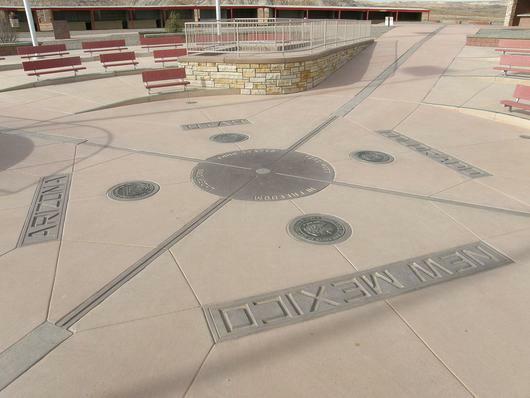 The Four Corners Monument marks the quadripoint in the Southwestern United States where the states of Arizona, Colorado, New Mexico, and Utah meet. I came across these ideas, discussions on the internet. So, I’ve been involved in the discussion on the thread about all these quakes happening on the 37th parallel. I am a skeptic I must admit BUT…I thought that maybe I would look into this in the biblical aspect. Some of you are scoffers…and that’s fine…others may find this EXTREMELY interesting! There are only a handful of books in the bible with 37 or more chapters. It just so happens…there is a strange line of commonality in the 37th chapter of books that have that many or more chapters. It’s like…beginning to end, the 37th chapters of these books tell the entire story of the bible! What an amazing discovery! Is it related to the 37th parallel earthquakes? I have no idea. It’s very interesting though. 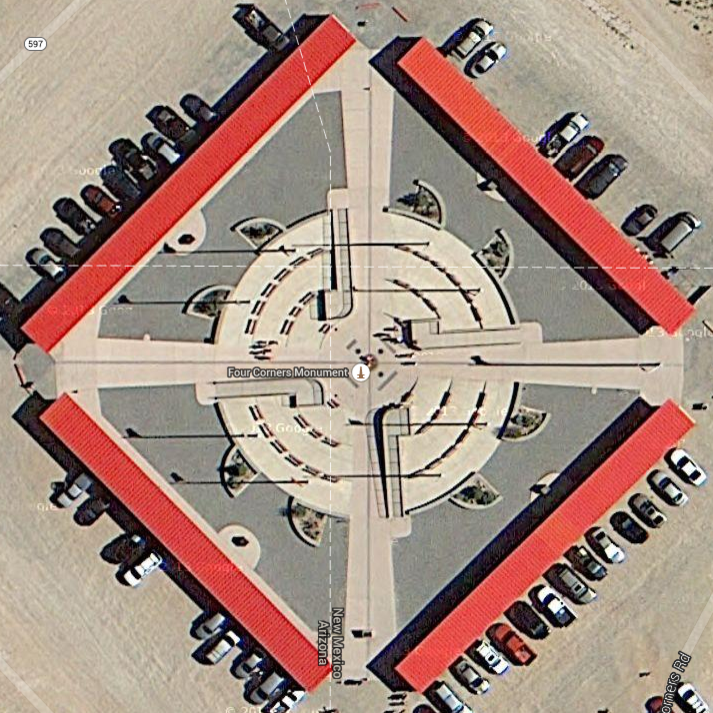 The Four Corners, a famous and popular tourist spot in the American Southwest, paradoxically is and is not where it should be. Its intended location was an even 109 degrees west longitude and 37 degrees north latitude. However, due to surveying errors, it didn’t come out that way. Whoa now I find that REALLY interesting because 1379 just happens to be ‘THE’ code that links the Freemasons (including George Washington) to the Maya and the Americas. 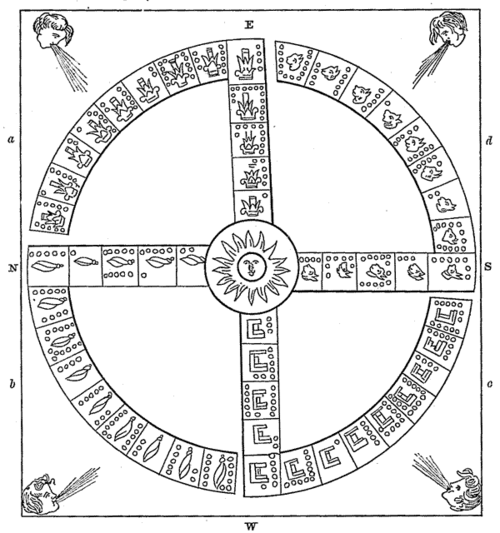 What does this Aztec calender wheel reveal to a seeker of truth? There are several locations around the ancient world that have inherited the accolade of ‘Earth Navel’. By definition, each location represents the place through which we connected with an invisible umbilical connection to the earth-mother-earth. These sites are invariably considered the centre of the world, or even the universe, and often become primary pilgrimage locations (such as Mecca or Allahabad). 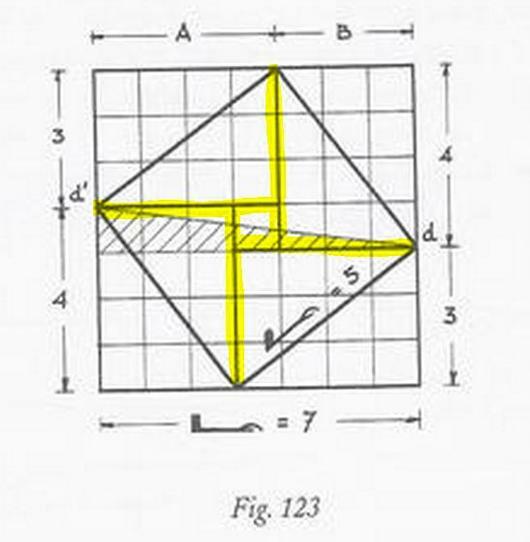 It has long been argued that there may exist a geometric connection between such sites, with a clear geodetic connection between Delphi and Karnak (Egypt), as established by Livvio Stecchini. ‘The Temple of Ammon at Thebes at latitude 25° 43’ N was considered, and is, located at 2/7 of the distance between the Equator and the pole. Ancient geographers divided the space between the Equator and the Pole into 7 zones. Egyptologists have vainly tried to explain why the Greeks gave the name of Thebai to the city called Wast by the Egyptians; the explanation is provided by the Hebrew word thibbun meaning “navel”. …the Samaritans never accepted such a shift, and geographically they were right, since the claim of Jerusalem to be the navel of the earth was not correct. The eastern gate of the Second Temple, where the standards of length were located, was called Gate of Susa, but Susa was located at the latitude of Mt. Gerizim which is 32° 11’ N. The sanctuary of Mt. Gerizim was located at a latitude that is 2½ sevenths from the Equator. 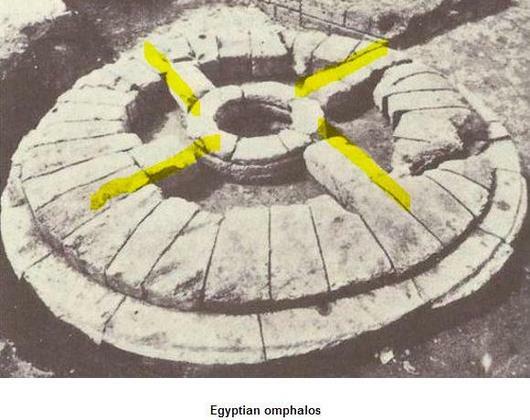 Egyptian benchmarks had the shape of the “navel” found at the Temple of Delphoi in Greece. These “navels” had the shape of a hemisphere with the meridians and parallels marked upon them; at times they are half a sphere and at times they are elongated at the Pole. The sanctuary of Delphoi was considered a “navel of the earth,” as being located at 3/7 of the distance from the Equator to the Pole. Let’s have a closer look at Judges 9:37 via the many different interpretations found in the many different bIbLEs, I have highlighted in red what I deem important at this time. And Gaal spoke again and said, See there come people down from the middle of the land, and another company comes along by the oak of Meonenim. Again Gaal said: Behold there cometh people down from the middle of the land, and one troop cometh by the way that looketh towards the oak. For more information regarding the very important concept regarding the OMPHALOS please redirect here after reading this short cut and paste. And what is the importance of 37 degrees latitude in the year 2017? What is going to occur in about Aug. 21, 2017 and the best potential vantage point will be around 37 degrees latitude and this district is called Little Egypt. Do you believe the coincidence exists? I do, but I would not call it a ‘chance event’, it is evidence of a design we do not comprehend. To me it’s rather common sense that underground tunnels are being constructed along this path. This is why there are so many military bases around and along the path. This would also explain the loud unexplained boom and construction sounds that nobody can explain and no entity or business will admit to. Simply it’s because nobody ABOVE ground is responsible for it. This would explain why officials are trying to say perhaps it’s something geological and environmental in the air. Now why is our government building this huge path underground is a more interesting question that I would love to hear an answer for. And where the Mt. Gerizim is identified and fits in … can I get back to you? In Samaritan tradition, Mount Gerizim is held to be the highest, oldest and most central mountain in the world. The identification of the two mountains is made clear in the Bible (Deut. 11:29–30; cf. Gen. 12:6; Judg. 9:7), and this identification is maintained throughout the sources (Sot. 7:5; Jos., Ant., 4:305; 11:340) down to modern times. As a result of an obscure topographical identification in Deuteronomy 11:30 – “Are they not beyond the Jordan, behind the way of the going down of the sun, in the land of the Canaanites that dwell in the Arabah, over against Gilgal, beside the terebinths of Moreh?” – and apparently in the wake of a dispute with the Samaritans, another tradition, ascribed to R. Eliezer, appears in the Talmud, which identifies the two mountains with two mounds which the children of Israel erected for themselves near Gilgal, and not with the two mountains near Shechem (TJ, Sot. 1:3, 21c; TB, Sot. 33b). This view was later adopted by the fathers of the Christian Church (Eusebius, Onom. 64:1920). On the Madaba Map, both traditions appear: next to Shechem is written Tur Garizin, and next to Jericho Ebal-Gerizin. Apparently, the Bible does not mean to imply that these two mountains are situated in the Arabah near Gilgal, but simply refers to the general direction in order to distinguish between this Arabah and the Arabah associated with the hill-country of the Amorites (Deut. 1:1; 4:49). Perhaps “behind the way of the going down of the sun” indicates the region west of the road which passes through the northern Arabah (from Jericho to Beth-Shean). I would very much appreciate to receive your posts per email or facebook. Thank you! Dr. Jordan Peterson ~ The Meaning of Music ~ DNA ~ George Merkl and Life Crystals ~ the ARK+E+typal 4 Evangelists ~ Rotas Sator Magic Square ~ the Great Pyramid ~ Hologram of a Photon ~ Photon Knights Templar Cross ~ "Let There Be Light"
55 ~ 64 ~ 73 ~ The Mithraic Origins and Meanings of the Rotas Sator Square ~ the Hypercube and the Amplituhedron tu?